← YEA Camp Hero Day 9: Leah CAREs About Animals! Welcome to Day 10 of our 12 Days of YEA Camp Heroes campaign – our way of highlighting the difference our campers are making and how, according to them, YEA Camp has helped. At YEA Camp, 14-year-old Sage from California shared that he was frustrated at how unaware some of his classmates are about things that are happening in the world, and that he felt his classes should teach more about important social justice and current events topics. Sage is super smart, knowledgeable and passionate about so many causes from the death penalty to climate change, gerrymandering political districts to the drug war. He wants other students to learn and care about these causes too. One group recently wrote a letter to the chef trying to get Meatless Mondays in the school cafeteria. Another group is working on reducing what they feel is censorship at school. Students are not allowed to do their own research on the computers, which they feel puts lower-income students without computers at home at an unfair disadvantage. Sage advocated to the administration for creating an editorial board for the newspaper, including getting other students to sign petitions for it, but was told that the school doesn’t want “kids getting their feelings hurt by others’ opinions.” He’s still working on that, but the club did successfully advocated for the school newspaper to add a current events section that addresses world issues. Sage also convinced his history teacher to start including current events and world issues in class, and he is planning on talking to other teachers about this as well. “YEA definitely empowered me to take action at school. Before YEA Camp I had a very cynical outlook on school policies and thought it was impossible to make any social change. I was wrong and YEA Camp taught me to be determined and motivated against all odds. … If not for YEA Camp I wouldn’t have been as confident or able to write or speak as persuasively as I did to authority. YEA Camp also taught me how to start a functional school club. If not for YEA Camp I would have given up the first time someone said ‘no’ to my activism plan. We are so proud of what Sage is accomplishing, and we love that he is finding ways to pursue different causes that are important to him while helping others to do the same. This is exactly what YEA Camp is about. As we approach the end of the year and prep for 2015, your donation can help us strengthen our ability to serve even more young people who want to make a difference. We so appreciate your support! 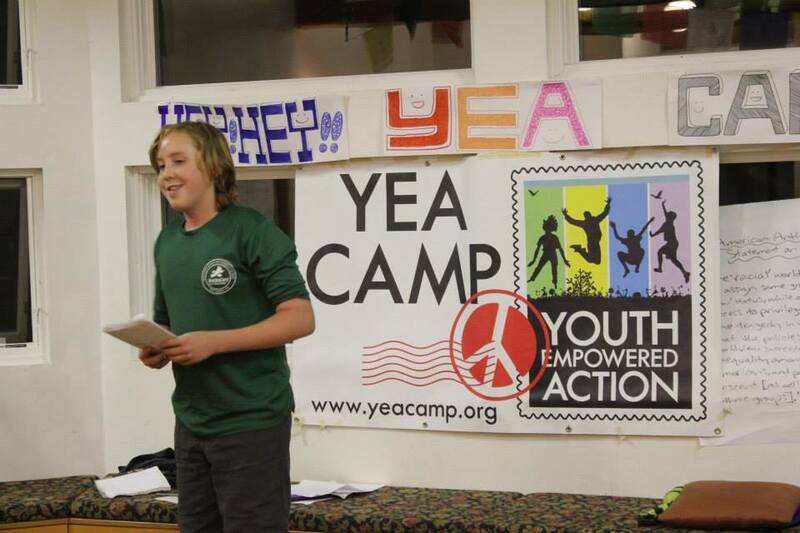 If you enjoyed reading about Sage’s activism, check out some of the previous posts about YEA Camp Heroes that you may have missed. There was Day 1 about Megan in Massachusetts raising money for the homeless, Day 2 showcasing Joyce in New Jersey speaking out about bullying, Day 3 highlighting Maddie in Colorado advocating for animals, Day 4 about Lia from Washington state working to address the stigma of mental illness and reducing teen suicide, Day 5 about Roberto from North Carolina speaking more confidently about progressive causes, Day 6 about Ana from California advocating for women, workers, animals, and more, Day 7 about Jia Hui’s animal advocacy, Day 8 about Shelby’s advocacy for gay and transgender rights, and Day 9 about Leah from Connecticut helping animals at her local shelter. Wow, that’s a lot of heros! And we’ll be honoring 2 more in the next 2 days! If YEA Camp sounds like the perfect place for you or a change-making 12-17 year old you know, send them to YEACamp.org and hopefully we’ll see you or them this summer! This entry was posted in Activist Profile, Youth Empowered Action and tagged youth leadership. Bookmark the permalink.